Graphics Card vs. Integrated Graphics is the most common question that I have been asked many times by people who are building their PC. In terms of performance there is no comparison of integrated graphics or onboard graphics with graphics cards. Integrated graphics generally comes bundled with your processor or motherboard. It is a great choice for users who are on budget and do not need anything fancy or are not gamers. You can do basic work on the integrated graphics, watch movies and can play smaller less demanding games but if you need more power, flexibility and features then you have to get a dedicated graphics card. 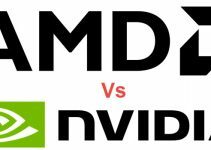 Integrated Graphics do have become much more powerful over the last couple of years but it does not mean that they can beat a decent gaming graphics card. Nowadays you can find better and powerful integrated graphics in latest Intel Core i3, Core i5 and Core i7 processors. The integrated graphics solution that you can find in Intel Processors is Intel HD Graphics. Also AMD has their own A-series APU (Accelerated Processing Unit) processors that come with powerful Radeon R7 and Radeon HD graphics. 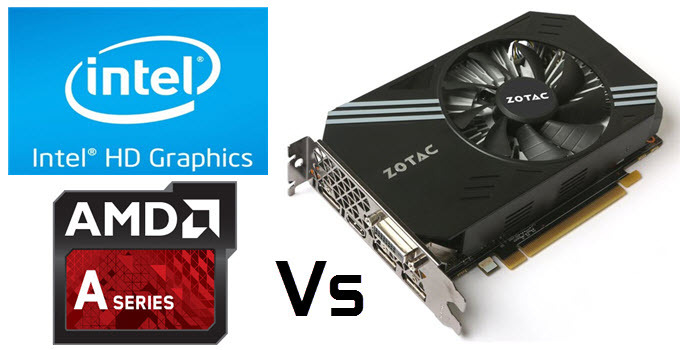 Here in this post I am going to make a general comparison between integrated graphics and discrete graphics card. Here is neck to neck comparison between integrated graphics and a dedicated graphics card. Please note that this is a generalized comparison and here i am not talking about a particular graphics card or integrated graphics solution. Integrated graphics have gone better but still they are no match for even a good entry level graphics card from Nvidia or AMD. For running latest games integrated graphics is a joke and even if it can run them then it will be on lowest graphics settings possible with low or unplayable frame rates. Whereas a budget graphics card like GT 730 or R7 250 will let you enjoy latest games on decent graphics settings and you can run older games and mid-level games at high settings. Also an integrated graphics solution does impact the performance of the system because it uses your system memory or RAM for its graphics related work whereas every dedicated graphics card comes with its own video memory which is much faster (GDDR5, HBM, HBM2 memory) than the normal system memory or RAM. For normal work and watching movies integrated graphics might be a fine choice but if you want to play games or want to work with professional graphics applications or softwares then you must buy a good dedicated graphics card for your PC. It is almost impossible to overlclock your integrated graphics for getting better performance but you can always overclock a discrete graphics card using good overclocking softwares and can get maximum performance out of it. Every graphics card has different overclocking potential so the performance increase does also vary from card to card. A dedicated graphics card comes with many advanced features and support for latest technologies that you cannot find in onboard graphics or integrated graphics. Also for running multiple monitors it is better to have a graphics card because it offers you better control, performance and flexibility. A dedicated graphics card has better driver support for games and graphics softwares & applications. 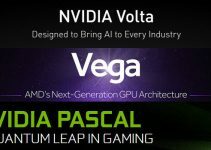 GPU manufacturers (Nvidia and AMD) regularly release newer and optimized drivers for their graphics cards time to time. This is not the case with integrated graphics as their driver updates are less frequent. This is the area where integrated graphics wins because it costs zero money to have it whereas you have to spend at least 50 dollars for an entry level or budget graphics card. The price goes higher if you want to buy a good mid-range or high-end graphics card. 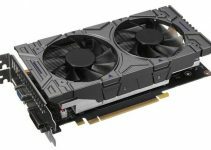 You can find a good mid-range graphics card for around 200 – 300 dollars whereas a high-end graphics card can cost you 500 dollars or more. At the end I would like to say that integrated graphics card can never match the performance of a dedicated graphics card. A dedicated graphics card is always better for gaming as well as for the total performance of your system. It does cost you some money but at the end it is totally worth it. 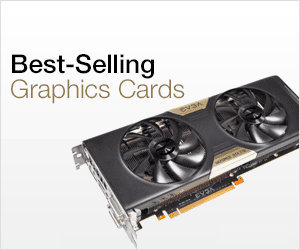 If you have any queries regarding which graphics card you should buy, then you can ask me by leaving a comment below.